The Hashimoto’s Adventure Island Arc continues in D-Frag! Volume 08. While this story arc isn’t my favorite, it is still wacky and D-Frag! is still one of my top two favorite manga titles. The story, in brief, has Hata revealing that she is the leader of the masked and cloaked girls from Seitachigawa Academy for Girls. They are motivated by having been previously rejected for the contest. With Hata having stolen all of the luck of Kenji and his friends, they are forced to play Roka’s game Cosmic Dirty Magazine Smuggler. The group decides to not rely on luck and cheat, tossing the dice and creating a hunt for them. During the hunt, Kenji stumbles upon Funabori and has to rescue her from the insanity. Ultimately, the group stumbles upon Sean Connery-sensei and his group as they find an ancient ruin. Within the ruins, the dice are found and the game resumes. However, Roka and company are losing the game. It is Kenji’s turn and though it is impossible to win, Kenji had cheated and drawn squares on the board to let him win. The girls gather their remaining luck and transfer it to Kenji, who wins the game by luck. The game over, it is time to leave, meaning they’ll never find Hashimoto. Hata gets Kenji to agree to meet again and play fair and square next time. Kenji then discovers he’s been given a cheap medallion attributed to Hashimoto. The following Monday at school, things are abuzz about the trip. Some guys get annoyed that Kenji was with Funabori and make him wear a wig. As such, when Takao and the others show up, they don’t recognize him. Kenji is annoyed that folks only seem to remember him for his hair. Takao tries to explain, but Kenji rejects it. Kenji is depressed to learn that he needs to strengthen his personality. 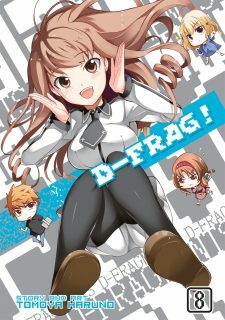 While the wacky adventures that have been a part of D-Frag! continue in this arc, sadly it isn’t as funny to me. To be honest, I never really liked Hata or her crew. I got the feeling that they may have been a parody of some shoujo manga, but I can’t be sure about that. Nevertheless, without finding interest in Hata or her girls, it made for a bit of slightly boring reading to me. It was more apparent in subsequent rereading of the volume for writing this review. I found myself just wanting to skip over all of this tedious stuff happening. I think the only thing I enjoyed about this part of the arc was Kenji’s running into Funabori. Well, that and Takao, Chitose, and Sakura getting angry with Kenji for not taking the game seriously. Hopefully, Haruno-sensei does a better job in future stories. I did enjoy the aftermath of the Hashimoto’s Adventure Island Arc. Not only did we get some followup with the adorable Funabori, but Kenji gets grief because of all the girls in his orbit. The funny part here is Kenji learning how even those close to him mostly think of his features via his hair. And then there’s Takao explaining how gamers remember things. Then when she tries to improve her visual memory of Kenji, that starts wiping out all of the game patterns she’s remembered over the years. For the regular part of the manga, this aftermath section was a big improvement. Hata and company were dropped and though there were a few random extras that showed up, they did add to the humor in the insanity Kenji is in. One of the things that I’ve really started looking forward to is the omake chapter at the end of the volume. That’s because Haruno-sensei continues telling a story of the Takao family. (I don’t think we’ll ever get given names for anyone in the Takao household.) While the story is about Takao not spending money on a swimsuit for the trip to Hashimoto’s Adventure Island, it is Takao’s mother who just steals the scene. She’s so awesome. Haruno-sensei keeps dropping hint about this life of adventure that she’s lead. Plus, the way she handles her girls just makes me laugh. My only minor complaint is that the English translation doesn’t do a certain joke justice. In this case, Takao’s mother is addressed in the normal, casual fashion. Then in the English, Takao’s older sisters start addressing their mom as “Mother dearest.” I’m 99% sure that they switched to calling their mother “Okaasama,” indicating great respect and such. Saying “mother dearest” kinda makes me cringe. It comes off as 100% sarcastic and not being respectful. Even though the sisters aren’t sincere in their respect, they way they address their mom isn’t sarcastic. Where the English version of the joke ultimately fails is when Takao’s mother decides that in the end, she’d prefer to be addressed as “Okaasama” after the sisters insult their mother. Having her say she’d prefer to be addressed as “Mother dearest” doesn’t feel right to me as the term still feels 100% sarcastic. On the Seven Seas side of things, Japanese honorifics are retained, which is always a massive plus for me. In addition to the omake mentioned above, we also get a manga page regarding Haruno-sensei. He then does a two page omake manga about the girls from Seitachigawa Academy. It didn’t do much for me ’cause as I’ve said, I just didn’t have an attachment to those characters. Seven Seas has the color page (front and back) at the front of the volume and a preview of the Nøt Lives manga. In the end, D-Frag! Volume 08 isn’t quite as good as earlier volumes, but it is still an enjoyable, funny read. And now to get volume 9 off the shelf and read it!